This article will show you how to import your existing Sears listings into Solid Commerce so you can manage them through our platform. In order to import your listings, you need to connect Solid Commerce to your Sears account, create a Sears Market List, and create a Sears Pricing Rule. For more info about these processes, see the Related Articles section. Before you can import your listings into Solid Commerce, you need to export them from Sears. 1) In your Sears Marketplace account -> Go to the Products menu -> Product Mgmt -> Bulk. 2) In the Step 2: Browse Catalog by Item Class section, select the Show Item Classes where I sell items radio button. Check mark the Item Class Root Node box at the top of the tree. 3) Click the Download button and select Generic Template (with items). 4) Open the exported file in Excel. 5) Select the tab named Data Format. 1) In the Solid Commerce menu of Excel -> Click on the Turn inline help ON button (if it isn't already on). 2) Click on the Convert Sears file to SC format button that appears. The file will automatically reformat itself into a format Solid Commerce can recognize. The word sears will be added in front of all the column headers that are part of the Sears export file. A few new Solid Commerce specific columns will be added to the left-hand side of the sheet. 3) Fill in the empty Solid Commerce-specific columns that were added as follows. Aside from the three shipping cost columns addressed at the bottom of the table, you don't need to change any of the Sears columns. results Leave this field blank. It automatically populates when you upload the file using the Solid Commerce Excel Add-In Tool. product custom sku Paste your Sears Item ID into this field. warehouse id Paste your Sears Item ID into this field too. list name The name of the Sears Market List in your Solid Commerce account. market auto rule The name of the Sears Pricing Rule you want to use to control the prices of your imported listings. Enter Yes to turn the automation on. We will automatically sync with your active Sears listings. Going forward, you will want to manage your quantities and prices through Solid Commerce, not Sears. If you enter No, your product will not sync with Sears until your turn the automation on. sears qty exp Enter lq in this field if you want to make your entire inventory available on Sears. You can also enter formulas. See Using the Listing Quantity Expression to Control the Quantities on Your Listings. If your products are in new condition, you don't need to populate this column. If you sell products in various conditions, you need to populate this column or the condition on your listings will be reset to New. It's important to note that our condition names are a bit different than the condition names that exported from Sears. The easiest way is to populate this column is to copy the values from the sears Condition column. Paste them into this sears product condition column. Paste our valid values over the values Sears provided in the export. The valid values are also visible if you hover over the sears product condition column header (inline help must be turned on), or you can view them in the Manager Excel Columns help. To keep your current shipping settings as is, leave the following four columns blank: sears ground free shipping, sears ground shipping enabled, sears expedited shipping enabled, sears expedited shipping enabled. Sears controls your shipping settings and fees through the following three columns: sears Shipping Cost: Ground, sears Shipping Cost: 2 day, sears Shipping Cost: Next Day. When you don't offer one of these options on a listing, Sears enters N/A into the cost column. Our system cannot recognize a value of N/A during the upload. The easiest way to prepare your file for import is to select all three of these columns and perform a Find and Replace to replace all of the N/A's with blanks. 1) Click the Upload Data button in the Solid Commerce Add-In Tool. Enter your Solid Commerce credentials. 2) Select the Update Marketplace option. 3) If all the listings upload successfully, you're finished with the import. 4) We recommend saving your file. We automatically submit price and quantity updates to every marketplace. However, to update any other field on your Sears listing, you need to provide all of the fields contained in the export. If you don't have your import file saved, the easiest way to update a Sears field is to export your listings and go through this import process again. After uploading a file to revise a Sears field, don't forget to select the updated item in your Solid Commerce Market List and click the Update Listings button. For full instructions, please see Updating Listings on the Sears Marketplace. Even if some of your items fail to upload and you need to add them to Solid Commerce, save your import file at this point (before adding the columns necessary to create new products). Your current version of the file will be easier to use for updates. 1) Check the results column. If any of your listings returned the error, "Failed to import sears market item: Could not find product in any Catalog," the products don't exist in Solid Commerce yet. 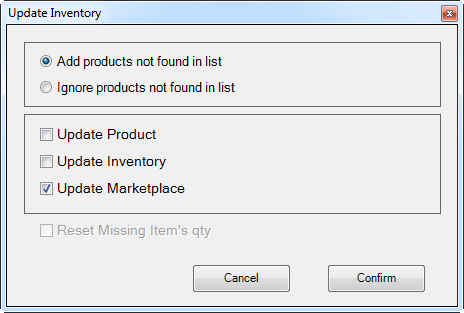 2) To add the missing products, group all of the listings that failed by sorting the results column in Excel. 3) Cut all of the rows that failed to upload. Insert them in Row 2 at the top of the Excel file, just below the column headers. 4) Insert a blank row below the rows that failed to upload. Our tool stops processing files when it comes to a blank row. 8) Add Product and Inventory information for these SKUs. The minimum required columns you need to add to your file are: product name, warehouse name, and qty. 9) Upload the file again, this time with a Product, Inventory, and Marketplace update.